Sovereign a great place to relax and think of ideas, look up at the stars to plan your next voyage. listen to the sounds of the waves and the birds chirping happily in the background. This is my place to relax and wind down on a hard days work that comes to being a star fleet officer. clicks combadge Lt.jg Debbydo logging off duty, there now its my time to relax. Goes to the pool side bar, barman can I have some of your fine romulan ale, thank you. Turns now where shall I sit the loungers or the hammock, hmm lounger more logical with a drink in my hand. 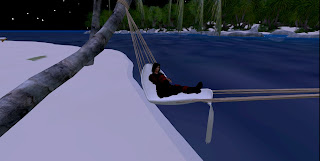 Stands goes to the hammock , climbs in slowly nods off till finally asleep.